In our customer centric world, both marketing and brand strategies are insights driven. However, complex and highly competitive healthcare environments can make gathering relevant insights challenging. This means brand managers and marketers may find it difficult to achieve a balance between brand optimisation and the risks associated with investment initiatives. Here, Head of Insight Martine Leroy reveals how gathering sharp insights will ensure brand managers and marketers achieve their business goals, while creating a customer-centric strategy. During the last decade, the methods insight professionals use to uncover opportunities for market managers have become more sophisticated. Now progress in the scientific understanding of behaviour is helping us achieve still sharper customer insights, making it is easier to find the sweet spot between business and customer needs. In the complex healthcare world, pharmaceutical organisations need to to optimise the value of customer research. This can be achieved by developing insights that are fit for purpose.Insight professionals design and conduct customer research to capture real behaviour and its meaning for customers, in different contexts. This gives brand managers and marketers true ‘insight’ – a fresh perspective, which guides brand initiatives in this sweet spot. Insight professionals are now using an increasing range of tools and approaches to better understand customer’s behaviours and needs. As customers become increasingly savvy, uncovering ‘meaning’ or the deeply emotive – the unsaid, the overt and the implicit – requires a tailored approach. The quest for meaningful insight is best achieved by close collaboration between Insight and Customer Experience (CX) professionals. At Blue Latitude Health, our Insight and CX capabilities work together to leverage expertise and approches, which helps to precisley identify and shape the sweet spot between the needs of the business and customers. This leads to solutions that are insights driven, really impact behaviours and are right for the business. 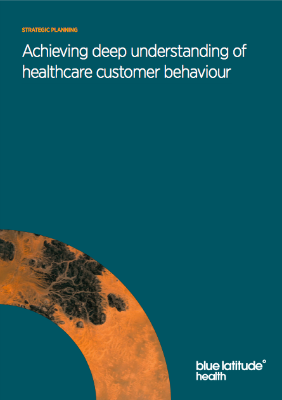 The two capabilities work together to uncover the meaning and patterns of customer behaviours by observing customers as they undertake tasks to reach specific objectives and then speak to them. This includes analysing the way they interact to uncover contextual motivations, frustrations and needs.